To make sure that little Ariann is coming out to spec, the Blocking Rug makes a guest appearance. I like to use this rug to *hold* pieces for blocking and measuring – pin usage is at a minimum because the rug pile *grips* the knitting. I like to measure my progress at several points to make sure I’m in the ball park. 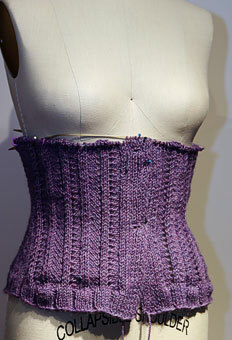 I measured after the ribbing, at the waist point and now, before joining (bottom and upper arm edge). This yarn is making a really nice fabric – drapey, soft and to gauge [4.75 sts/6 rows or 19/24, using the larger needles]. This should be even better looking after a nice wet blocking. The body section is gently patted out on the rug then meausred, from side point to side point. I’m getting a hair over 19″ – am making a 38″ sample, so all is well. The dimensions given for this design are finished measurements – the actual circumference of the lower body piece. 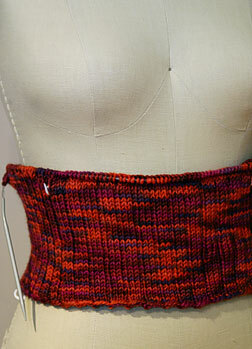 I chose a size nearest the dimensions of my favorite fitting sweater – choose up rather than down if close. I think I might have to re-think my favorites and work this in! 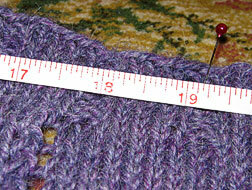 Ariann #2 on the needles, is 2 shaping INCs away from being at the joining point. I’ve got the yarn all wound and am ready to roll out to the bus and hit it. It is going with me everywhere – has a hot date on the 10th of December. Today, we look for buttons – can’t wait to see what Michelle has come up with – she’s making Ariann with this yarn too – spied it at our KIP. I can’t decide what would go best with this – brown? grey? not purple? black is too deep toned. What do you think wouldn’t detract from the song of the lilac? The vest. It grows. 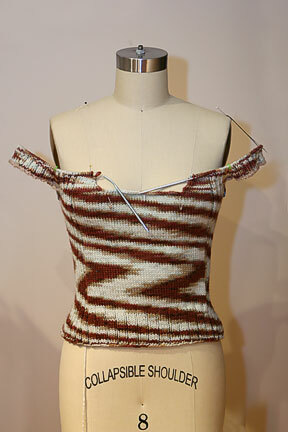 The pattern from the hand painted yarn is intriguing me such that I can’t wait to see what comes next. This little number has become a reward, so to speak, or perhaps, more accurately, a bribe. There’s a lot cookin’ in the kitchen at Chez Chic and to keep myself on point, I work a few rows on a fab personal project to reward myself. Another, quicker (and necessary) reward – some new Boots! 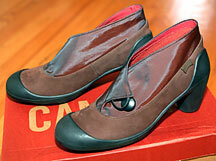 These are by Camper and were harvested on a shoe sale romp with Theresa on Sunday. The combination of materials in these boots is what caught my eye: rubber toe kicks and 3″ heels, Nubuck sides, Taffeta tops! But wait, when the brain is all fired UP, one project isn’t enough. Just when you need to be focused on the singular, the multiple will be very appealing. And we’re not talking about any old project. Or, maybe we are! The uncontrollable urge to re-work re-model a previous project just might strike.